This is output from a virtual machine running on your computer! Virtual machines produced in this way run Ubuntu GNU/Linux (https://www.ubuntu.com) with the XFCE window manager. 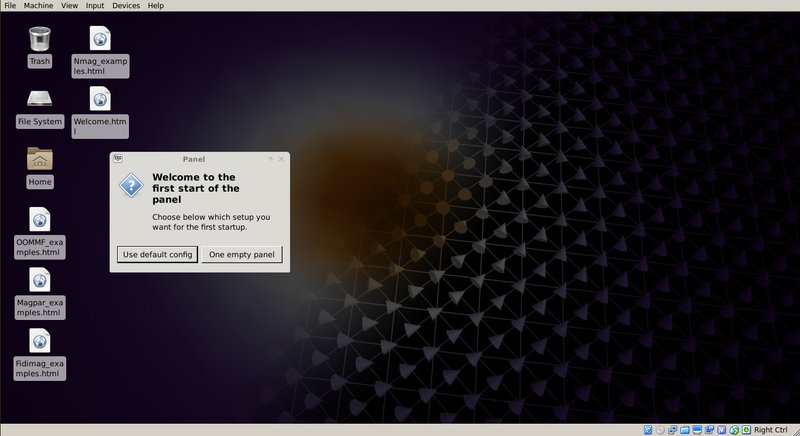 From here, you can follow instructions in the welcome file on the desktop to run simulations with the installed packages. Never worry about software dependencies again! 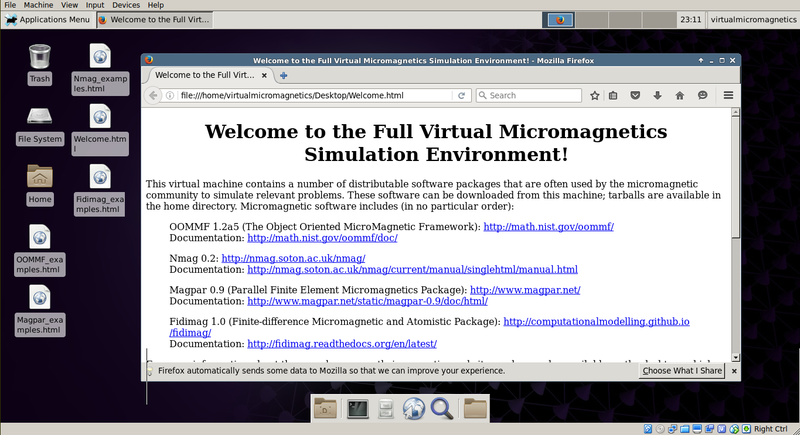 Next, see Virtual Micromagnetics Environments and Simulation Software for the environments that are available besides the Full Virtual Micromagnetics environment, and the software on these environments, or you can read on to learn about container virtualisation. This command will download the Full Virtual Micromagnetics container image from the Internet to your computer, and start bash in your shell. Now take a look at Virtual Micromagnetics Environments and Simulation Software for the environments that are available besides the Full Virtual Micromagnetics environment. Note that the docker group is root-equivalent, so you will likely need to own the machine to use Virtual Micromagnetics containers. To avoid this, consider using a different provider that does not require root privileges, but beware, as Docker is the only container provider supported at present. © Copyright 2016, Mark Vousden and others, University of Southampton. Revision 60095936.